There's no exorbitant amount of photos OR instructions for this post because it was just too easy. But it tasted OH so good! And I couldn't leave it off the "what we bought, what we made" series because it's exactly the kind of meal that rises triumphantly from the seemingly barren pantry hole! James and I wanted an early dinner and early bedtime just the other night and the LAST thing we were going to do was grocery shop, or go out to dinner. We opened the fridge and saw a whole lot of nothing staring at us... but then I spotted that awesome leftover meat pie filling and got inspired. There was only enough left for one person, and being that I don't mind going vegetarian, we were set. Naked tacos it was! I knew we had a leftover bag of chips that our friends Nolan and Nicole brought over the night we all made those killer fish tacos, and we had plenty of black beans, corn, lettuce and salsa, considering we bought the salsa from Costco... so we were in business! First, heat up that onion and meat mixture in a small skillet. Then mix together black beans and corn in a small saucepan and begin to warm those over medium heat. Add in a healthy amount of Valentina hot sauce or whatever hot sauce you prefer (although I highly recommend that), and stir and let simmer while you prepare the other ingredients. Finely chop some romaine lettuce, grate or chunk some white cheddar cheese, slice an avocado, half for each person, and slice a lime in half for squeezing. Arrange the lettuce on the bottom, dish out the meat mixture and pile it on top, place the white cheddar cheese atop that and let it get a little melty before continuing. Next add on the black bean and corn mixture, then top with the avocado, greek yogurt, more hot sauce and salsa, then finish by squeezing fresh lime juice over the whole plate. 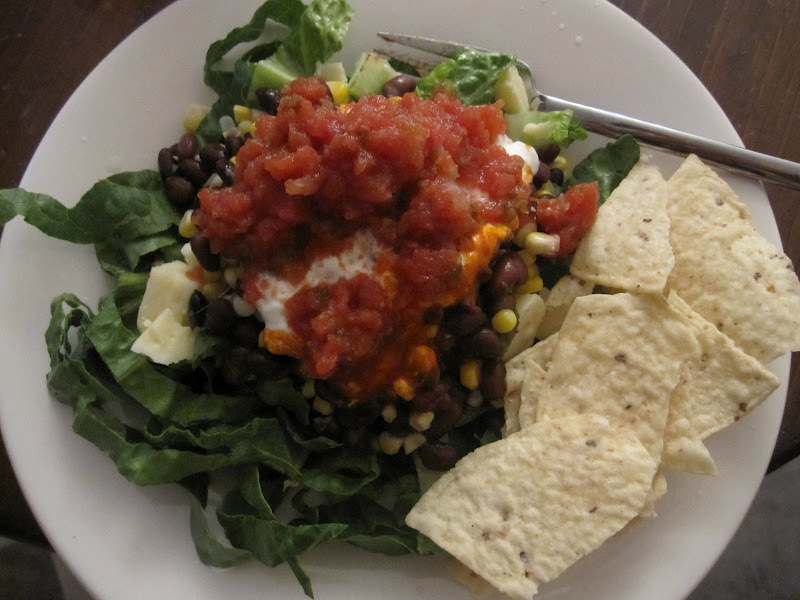 If you're the one with the vegetarian plate, place the beans and corn mixture right on top of the lettuce and do the same with the cheese, letting it get melty first. Toss some chips on the side and call it a night! breakfast " banana pudding "
technical difficulties . . .
girl 's night fancies !